Names are important. They identify us. They influence our actions. Many of us might be named after a relative or our name stems from something or someone our parents loved. Whether or not you are named after someone in the past or not, your name has now become who you are. You hear it from across a crowded room when someone might be discussing you, and you listen harder, wondering if what they say is good or bad. When we are baptized as members of the Church of Jesus Christ of latter-day Saints, we make a covenant to take Jesus Christ’s name upon us. [When] we promise to take His name upon us, that means we must see ourselves as His. We will put Him first in our lives. We will want what He wants rather than what we want or what the world teaches us to want. True Christians will hear Christ’s name in a crowded world and listen for whether good or bad is said about the Name they love. If His name is reviled, we stand up and defend it, for we love His name as we love our own and don’t wish it slandered. True Christians will identify as a child of God. We will love our Savior and praise Him for His mercy and saving grace. We will share with others what He has done for our salvation. We will shout from the rooftops that Christ has redeemed mankind from physical death and can save us from spiritual death if we repent and come unto Him. True Christians put Christ first in their lives. The world tricks us by telling us other things should come first, like our families, careers, our own desires and wellbeing. But even something as wonderful as our families comes second to God. If we put our spouse or children above Him, we will slip and find ourselves in the whirlpools of the world. Taking upon us the name of Christ and placing Him as our number one priority will keep us balanced and centered. Our families will be better off when we put Christ first. Our mental, physical, and social lives will improve when Christ reigns supreme in our thoughts. In the world today, it isn’t always easy to be a true follower of Christ. The media demeans religion and those who embrace it. 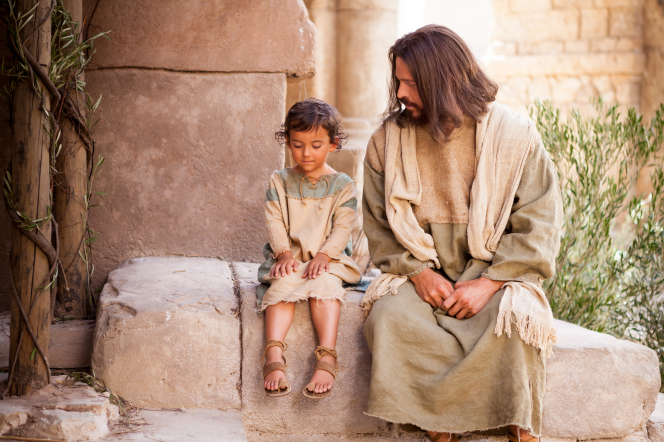 Politics and governments seek to cast Christ out from their meetings, buildings, and decisions, or at best, put Him aside for when they really need Him. But no nation can be great unless Christ is at the helm. The world mocks those with faith. They taunt or outright persecute those who put God’s laws higher than the world’s. But when we covenant to take upon us Jesus Christ’s name, we bear the crosses of the world…just as He did when He walked the earth. Jesus walked a thorny path in life. The Jews of Jerusalem and Galilee didn’t accept Him as a whole. Most reviled Him and accused Him of being bad when He was the definition of Goodness. Christ expects the same of us. Some will follow when we talk of Christ and preach of His life and Atonement, and beckon them to follow. More will mock us, ridicule our faith, and labor diligently to get us to deny His name and follow the world. In the Book of Mormon, the cause of the Christians was in peril. The Lamanites, and even some of their own people–the Nephites–were gathering to battle against them with the intent to destroy them from the earth. Moroni’s battle cry is one we can use today as the world gathers against those who follow Christ. We will ultimately win the battle against the world if we follow Christ. No matter how many mock, taunt, judge, persecute, rail, or slander our names, if we have taken upon us the name of Jesus Christ and are His people, He will enable us to overcome the world. As true followers of Christ who take upon us His name, we should do the same. We should forsake our nets–reject worldly traditions or practices, repent of bad habits, sins, addictions, and leave behind anything that tries to take higher priority over our Savior and Redeemer. This change is called conversion, and is only possible through Jesus Christ. He can make weak things strong. When we truly take upon us His name, we are made new. Our very natures change and we no longer want to return to our old ways. After Jesus was crucified, his apostles were distraught. Their Master had been killed. They were left alone and did not know what to do. So they returned to their old lives. Peter and Andrew went back to fishing. They fished all night and caught nothing, then saw a man on shore who told them to cast their nets on the other side. They’d already done that, but heeded his suggestion, and their nets became so full that they broke and needed other fishermen’s help to bring in all the catch. Peter recognized that it was the Savior on shore, and he cast himself into the water and swam to shore. Once they reached him, Jesus gave them a feast of fish and bread, then asked Peter three times if he loved Him. Each time Peter answered, Yea, Lord. Thou knowest I love Thee. As we follow Christ and feed His sheep, He has promised that He will bless us with gifts, talents, and the strength to continue to do His will, allowing us to move beyond our comfort zones and accomplish things we never thought possible. Taking upon us His name ultimately makes us like our Savior…in word, deed, thought, and power. His will becomes our will. Our weaknesses are made strong in Him. And in the final day, He will make us perfect as He is. That’s the power in His name. May we do all we can to uphold His sacred, most glorious name, and make it our own in all we do and say. This is such a beautiful article, reminding us of the importance of taking upon us our Savior’s name. Thanks for the reminder. I’m glad you liked it Linda.